Keep your pet safe with the Kokoba car seat belt for dogs. The strong strap fits your car’s seat belt coupler to secure your dog while on the open road. This seat belt clips into your car’s belt coupler. 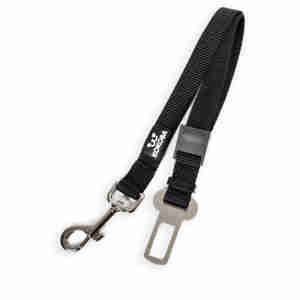 At the other end of the belt is a clasp which attaches to your dog’s harness. The belt is made from tough nylon and the clasps from strong nickel which will hold firm even if you brake suddenly. You can adjust the length of the seat belt from 46 to 70 centimetres to keep your dog secure and comfortable. Going on the road with your dog? A loose pet can distract you from driving and they can hurt themselves if you brake sharply. The Kokoba car seat belt for dogs keeps them safe when travelling. Team with a product such as the Kokoba power dog harness to secure your pet on the open road. When travelling with a dog, vets recommend fastening them to the rear seat with a seat belt and harness. If you're going on a long journey, make sure to plan time for frequent stops so that your dog can get some air and stretch their legs. Remember to offer them water when you stop, as stuffy cars can quickly become hot and uncomfortable. Never leave your dog unattended in the car – even for short periods of time. Even in the shade or with the windows open, a car can quickly become dangerously hot for dogs. Stay alert to the signs of heatstroke, including heavy panting, drooling, clumsy or slow movements and vomiting to keep your pet safe. I have been tying my dog to a connected seat belt in the car for 8 years. I have now discovered this seat belt for dogs and it has made securing him much quicker, easier and I feel he is safer with it as well. a very good buy. I thoroughly recommend it.